I was driving up and down Kickerville Road looking for a thirty year old horse I had heard about, when I came across the snake man and one of his many resident reptilian creatures. It seems that Dave Andrus has taken action to satisfy a lifelong longing to salvage slithering slinking serpents seeking satisfactory sanctuary. Dave has formed Help The Homeless Snakes Organization, a not for profit rescue agency committed to the well being of various vipers, pythons, boas and smaller species too. He helps recover reptiles at risk that have been abandoned or are badly neglected. 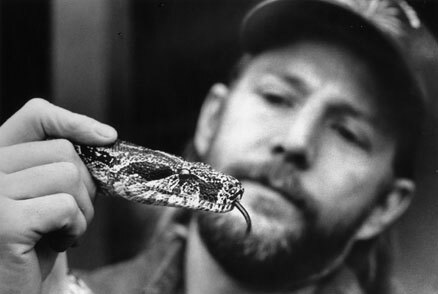 Dave is holding a long forked tongue wrap all around'ya Argentine boa constrictor who travels in a canvas bag when he is not on display hooked to his handler's elbow while twisting and turning all the while. This 6 foot long snake is on the endangered species list when not being safely held by Dave. Most of the eleven snakes he and his wife Jennifer care for have come from college students who have quickly outgrown the novelties of viper ownership. Even as a kid he liked real creepy crawly things and he loves to share animal stories with his horse trainer wife during dinner time.